UOregon iPhone app provides valuable resources for students and faculty. As an existing ArcGIS Server user and key ArcGIS API for iOS early adopter, University of Oregon's (UOregon) InfoGraphics Lab set out to provide a free, useful mobile mapping application for the university's 20,000 plus students and faculty members. With support from the Department of Geography and Office of Communications, the InfoGraphics Lab built an official campus-themed iPhone application that would provide practical maps and tools for the entire University of Oregon campus. The lab consists of graduate student developers, undergraduate cartographers, staff, and faculty who worked together to design the UOregon application using ArcGIS API for iOS. The team had previous GIS experience using Esri's Web mapping APIs and was able to build the initial iPhone prototype application in just a couple of weeks. They wanted to go beyond geocoding points on Google Maps and needed an application that could accommodate high-resolution vector overlays that would render correctly and run effectively. With ArcGIS API for iOS, the team had plenty of resources already intact, along with the ability to serve maps as a tiled image cache. One of the team's biggest challenges was rethinking and redesigning all the existing campus maps to fit the iPhone's limited screen real estate. The InfoGraphics Lab was able to integrate search and map features contained in the ArcGIS API into its own application. "We took inspiration from Esri's ArcGIS API for iOS application," says Ken Kato, assistant director of UOregon's InfoGraphics Lab. "There were a number of aspects in Esri's iPhone application that we thought were great, and we incorporated some of them into the development of ours*mdash;in particular, the clean simplicity of the search function that presents the user with an entire page to view results and make selections, as well as the interface for browsing and selecting custom map services." 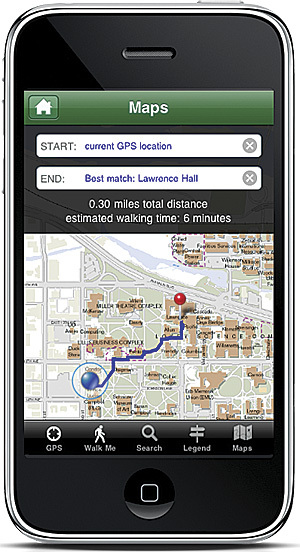 The UOregon application includes a GPS feature that shows users where they are on campus; provides point-by-point map directions showing the most accessible walking and bicycle routes and the safest routes at night; parking and transit maps; and aerial map overlays with campus images from 2008, 1947, and 1913. There is also a useful Walk Me feature that displays a route of start and end points anywhere on campus, including estimated walking time. University of Oregon's mobile mapping technology also helps students find their classes, access campus security in the event of an emergency, locate on-campus activities, and keep up with social media. Application users can also stay up to date on UOregon news and events, view the 295-acre campus with a continuously updated feed of photos and videos, and listen to the Oregon Marching Band play the school's fight song, "Mighty Oregon." With more than 5,000 students and faculty currently using the UOregon iPhone application, as well as positive feedback and very favorable ratings in the Apple App Store, it won't be long before other colleges and universities integrate mobile GIS mapping capabilities to create an immediate, on-the-go experience that is always available for students right at their fingertips. 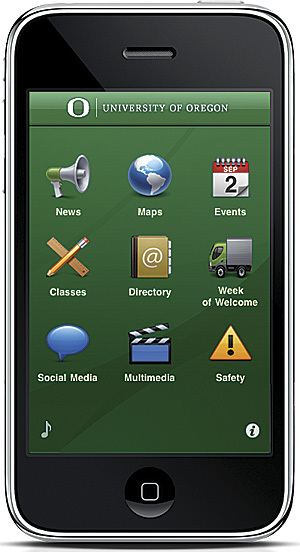 For more information on the UOregon iPhone application, visit uoregon.edu/mobile. Also see "ArcGIS API for iOS Now Available."